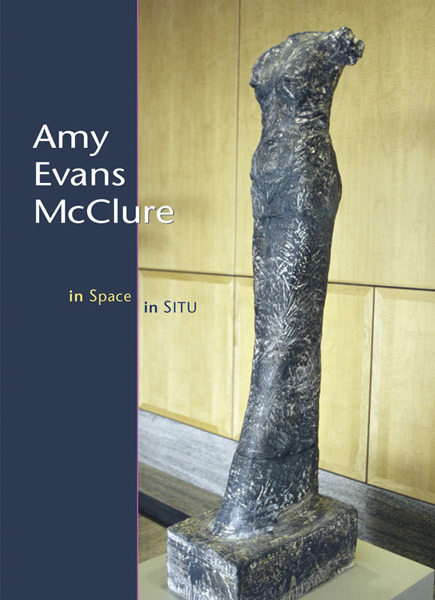 In Space in Situ is a book of Amy Evans McClure's art, thirty-four color photographs of ceramic sculptures, with an essay by editor for Art in America, Michael Duncan, and poetry by Michael McClure. Evans McClure's sculptures, such as horse heads (one can whirl, some are on wheels), tall winged Stelae Furies the parts of an outdoor installation, figures of Hathor and of a seated Egyptian scribe (installed in the Bancroft Library), abstracted features like vitalism in dreams, led Michael Duncan to compare Evans McClure to "fellow contemporary image-builders" Kiki Smith and Louise Bourgeois. Her figures are as if silent containers of language, a relation then supplied by the essay and by Michael McClure's poem citing the ceramic forms as containers of her immediate actions: "THEN YOU GLAZE / these shapings from long, / sudden childhood memories."